St. Croix is part of the U.S. Virgin Islands and is an island paradise complete with lush tropical hills, warm and brilliantly turquoise water, a rich history and a wonderfully tropical climate. 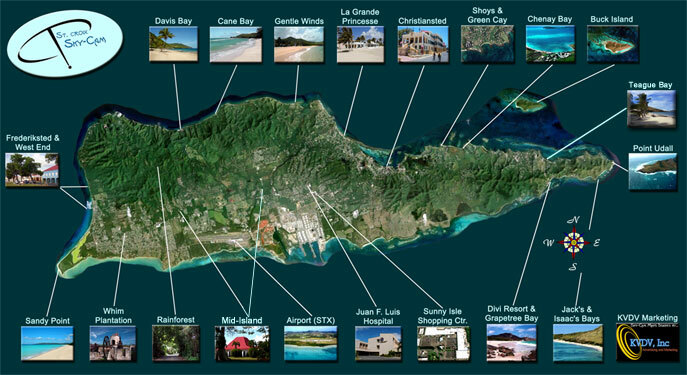 It is the hidden gem of the Caribbean! You will find beautiful white sand beaches...fabulous, tropical weather...great dining and restaurants...lots of duty free shopping...incredible SCUBA diving...three golf courses and two historic and charming towns...all wrapped up in a friendly and laid back island atmosphere. You won't find the crowds that many other Caribbean destinations can have, and it's easy to travel to St. Croix from the mainland. U.S. citizens don't need a passport. "Saint Croix" is only a 30 minute flight from the international airport in San Juan, Puerto Rico, and direct flights from the states on American Airlines (via Miami), Delta (via Atlanta) and JetBlue (via San Juan). of this website. If you see errors, bad links or any information that is out of date or incorrect please contact our webmaster. Thank you!